Michaels Arts & Crafts Store is definitely one of my favorite places. Whenever I realize that a new seasonal table arrangement or door decoration is needed, Michaels is my destination. I enjoy arranging silk flowers. It's a fun hobby to take the purchased floral stems, cut the selected flower/flowers to a desired length and place the stem ends into a foam block that has been glued inside the bottom of a container. One placed here, another there. There is no time limit and I find it quite relaxing. About two weeks ago when I shopped, it was a tad more fun to wander in the front aisles of Michaels, because all of the floral stems were discounted 50%. Yes, definitely I knew this before my car left our driveway. Purchasing an item on sale is the way to go. That is my belief with most items, unless it is needed pronto. After Thanksgiving last year I did take advantage of the Michaels specials on containers/baskets. 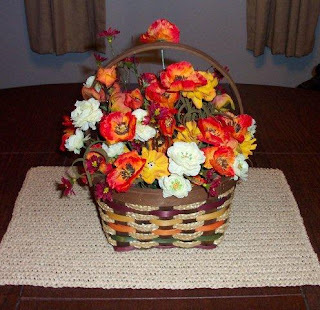 The fall colored basket that I had chosen last year would be filled this fall with autumn colored flowers. Do you find hobby supplies at Michaels? It is official! 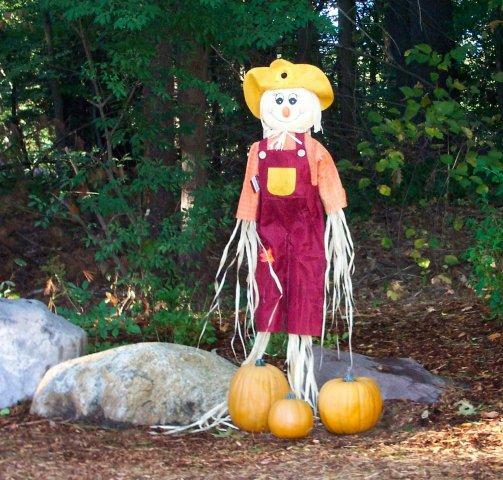 It's Autumn! On some mornings when the weather gets a bit chilly, hot Cream of Wheat cereal makes one very warm, filling, tasty breakfast. It's quick - takes 2 minutes and 30 seconds to simmer on top of the stove. 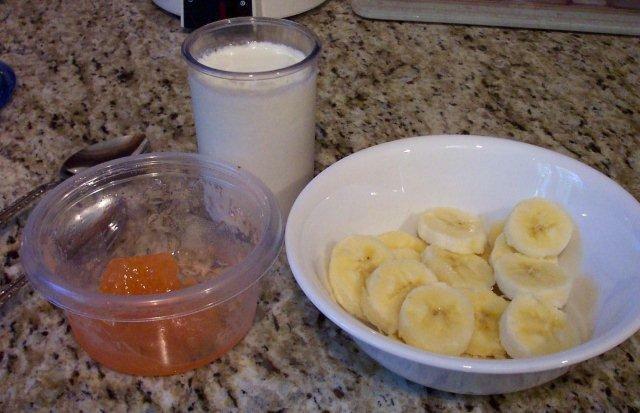 It's easy - 2 ingredients - the dry cereal and the Milk. I use Soy Milk. No optional Salt for me. The familiar red box states that this prepared cereal contains Calcium and also Iron. Now, this is where those brown spotted overripe Bananas sure do come in handy. O.K., I use three ingredients. Two mornings ago it was a Cream of Wheat AM. Now, it feels like summer, again. Ah, New England at its best! Do you enjoy hot cereal on cold mornings? 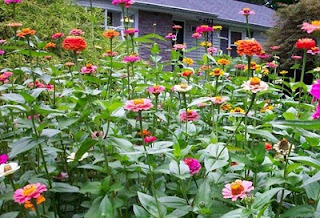 As we made the left turn into our driveway, the vibrant colors in the cut-out on the right greeted us! 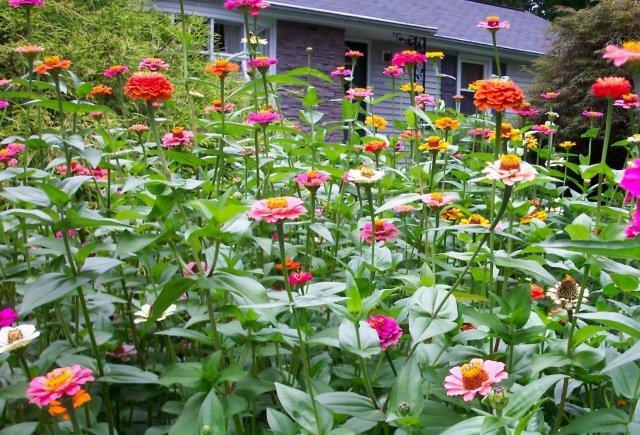 These colorful gorgeous Zinnias grew from seeds that were saved from last year's plants. There are even more buds ready to burst open. What a nice welcome! Now that I'm back into a routine, it's also time for me to remember the daily habit of "enjoying" a Banana every day for the Potassium content. My blogging buddies know well that I try to hide or even ignore that healthy yellow fruit whenever possible! :) However, today's lunch - Yummy Yogurt with a little Peach Freezer Jam drizzled on top, all with a sliced Banana (ripened just right). Cannot forget the tall glass of O.J. Is there a food that you do not particularly enjoy, but eat anyway? Tonight we used our outdoor grill, again - Grilled Sockeye Salmon! Usually, I am very aware of what is in my fridge. Usually, I have all of the necessary ingredients for a recipe. Usually I recognize the difference between an opened and an unopened container on the top shelf in the fridge, even if it is located in the back. The important word here is usually. Every morning I consider black coffee to be in its very own important food group. So this AM after enjoying a cup of my necessary first food group, I was ready to start in on the Blueberry Buttermilk Pancakes for breakfast. The variety of pancakes we did not have last weekend. 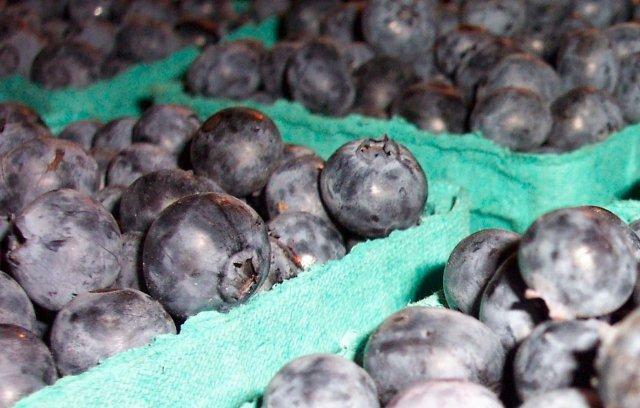 I was envisioning a breakfast of light fluffy cakes dotted with dark blueberries. A stream of maple syrup would be dripping down the pile on a plate. Yummy! After the majority of ingredients were ready, only the liquid needed to be added to the batter. Once again the fridge door was opened, but the familiar quart container of Fat Free Buttermilk was no where to be seen. So, thinking way back into the depths of the memory to what I sometimes did years ago when 1 Cup of Buttermilk was needed but not to be found... 1 Tablespoon Lemon Juice is placed in a liquid measuring cup and Milk added to make 1 Cup. O.K. I needed 3 Cups, easy enough. I had Lemon Juice and I had 1% Milk. The resulting batter was o.k. The pancakes tasted good. Maple Syrup did roll down the stack just as I had envisioned. :) There were many pancakes to place in our freezer - always an added plus. My DH gave them 2 thumbs up! Sweet! However, my light fluffy cakes dotted with dark blueberries were no where to be seen. :( You know the expression - Flat as a Pancake. Well, last week the opened quart container in the fridge had been tossed, because it only contained a small portion of Buttermilk. The grocery list containing the word Buttermilk was lost on the way to the grocery store. Then, getting ready to drive into Boston for the Boston College Football game took top billing. As the saying goes, "Variety is the spice of life." It's also quite amusing at times. Unless there is a blizzard, an ice storm or a heat wave (like currently here in New England) my hubby & I take a daily walk. The exercise is important for health and it's a great way to greet our neighbors as we move along. There is always time for a friendly, "Hi!" This past weekend our sons & families were in for a family visit/neighborhood Get Together. Saturday AM arrived very quickly with many last minute preparations. Hearty Pancakes that have been prepared, ready and waiting in our freezer always work so well for quick breakfasts. Earlier in the week a quart of Fat Free Buttermilk was in my fridge. 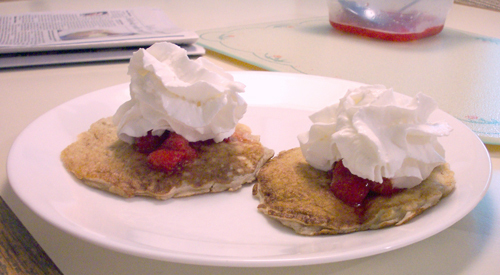 A dilemna - which Pancake to make - Blueberry Buttermilk or Oatmeal with Strawberry Topping? You guessed it - my hubby enjoys the Blueberry and I am so partial to anything containing oats. Our son likes both Strawberries & Blueberries. The last couple of batches of Pancakes this summer I've made Blueberry Buttermilk, so this time Awesome Oatmeal Pancakes with defrosted Strawberry Topping it was. There always is a canister of Reddi-wip on the top shelf of our fridge. Just like the ole' days! :) This week located next to the Reddi-wip is a new quart of Fat Free Buttermilk! Does everyone in your family have the same fav Pancake? Enjoy this Labor Day weekend. If you are in Earl's path - Be safe!